Hilton Cardiff HotelThe Hilton Cardiff hotel is located in the heart of the city and is a five minutes’ drive from the railway station and 30 minutes from Cardiff International Airport. Offering the best in Welsh hospitality, this Cardiff hotel is directly opposite Cardiff Castle, and just minutes from the St David's 2 shopping experience. Relax with a swim in the pool or enjoy a beauty treatment at The Escape Spa or let off some steam with a work out in the gym. Explore Cardiff attractions like the Millennium Centre, Millennium Stadium, The National History Museum, St Fagans, Techinquest and Cardiff Bay. Sample relaxed all day dining at Grey restaurant or treat yourself to a cocktail in our Metropole Lounge or maybe a specialty Coffee and Cake in Costa. Do business in the Executive Lounge or plan an event in one of seven meeting rooms and stunning ballroom for up to 350 people. All 197 bedrooms are fully air conditioned and have separate walk-in showers. From standard guest rooms to Junior Suites, all rooms have WiFi. Stay in an Executive Room and gain access to the exclusive Executive Lounge, situated on the 7th floor with excellent views of the city. 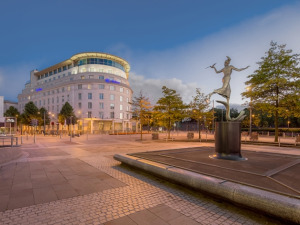 The Hilton Cardiff hotel is located in the heart of the city and is a five minutes’ drive from the railway station and 30 minutes from Cardiff International Airport. Offering the best in Welsh hospitality, this Cardiff hotel is directly opposite Cardiff Castle, and just minutes from the St David's 2 shopping experience.